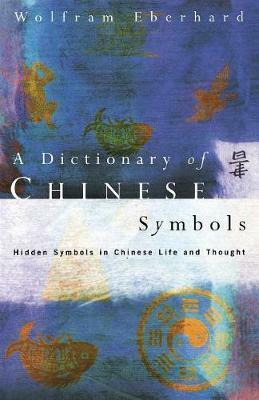 This unique and authoritative guide describes more than 400 important Chinese symbols, explaining their esoteric meanings and connections. Their use and development in Chinese literature and in Chinese customs and attitudes to life are traced lucidly and precisely. This book contains some four hundred symbols, and even a casual runthrough will show how many of these are concerned with the same few basic themes. These were the things that mattered to the Chinese in their everyday lives, their heart's desires-to live a long and healthy life, to attain high civic and social rank, and to have children (i.e. to have sons). "An ideal reference book to help one learn and explore further, while simultaneously giving greater insight into many other aspects of Chinese life. . . . The most authoritative guide to Chinese symbolism available to the general reader today. . . . [A] well researched, informative and entertaining guide to the treasure trove of Chinese symbols." Wolfram Eberhard is Professor of Sociology at the University of California, Berkley.